Though Bernie ended service January 1, 2019, Farsijana continues to serve as a mission co-worker. Farsijana periodically travels to the U.S. and is available to visit congregations. Email her to extend an invitation to visit your congregation or organization. 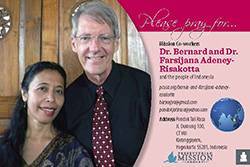 Bernie Adeney-Risakotta came under appointment as a mission co-worker for the PC(USA) in 1991, and he has served continuously since then. Farsijana came under appointment in January of 2003. Bernie was founding director of the Indonesian Consortium for Religious Studies (ICRS) at Gadjah Mada University (UGM) in Yogyakarta. Farsijana is the founder of the House of Authentic Sense (HAS) and works with the Center for Development and Social Transformation in the Faculty of Business at Duta Wacana Christian University in Yogyakarta. Both Bernie and Farsijana spend a lot of time working together with Christians and Muslims to build a just society. In 1997, Bernie married Farsijana and moved to Yogyakarta to serve as assistant director of the Graduate Program in Theology at Duta Wacana Christian University. In 2003, he started teaching graduate courses at the State Islamic University and at Gadjah Mada University, the oldest and largest national university in Indonesia. Most of Gadjah Mada University’s 56,000 students are Muslim. This experience led to the founding of ICRS, which quickly became an internationally acclaimed, interreligious program and is the only known cooperation of its kind between secular, Muslim and Christian universities. In the late 1990s, Bernie and Farsijana built a home in an all-Muslim neighborhood that serves as a center for community outreach and hospitality. It is called “Pondok Tali Rasa.” At any given time, they share it with several other people of both Muslim and Christian faith. Their house also served as a center for an organization that Farsijana led, the Indonesian Women’s Coalition (KPI), which empowers women and serves the victims of natural disasters. The Republic of Indonesia was formed in 1945, when it claimed its independence from the rule of the Dutch. Indonesia’s population consists of many people groups who live on the 6,000 inhabited islands across the archipelago. Indonesia is home to the world’s largest religious Muslim population, and adherents to Islam comprise about 85 percent of the population. Christianity, the faith of about 10 percent of the people, came to Indonesia in the early 16th century with the arrival of Westerners. The Presbyterian Church (U.S.A.) began its involvement in Indonesia in the 20th century and continues to serve with partners in theological education, interfaith relations, and disaster assistance. Bernie first visited Indonesia in 1972 and 1973 and fell in love with this beautiful country of 17,000 islands. In 1989, he visited again while on a sabbatical leave from teaching in Berkeley. He felt called to work in Indonesia when a Christian university in Java invited him to help them establish a graduate program in religion and society. He returned in 1991 as a PC(USA) mission co-worker and worked for six years helping to establish a graduate program to study how Christianity, Islam and other religions affect Indonesian society. Bernie writes of his experience in Indonesia: “Since I was born in China and grew up in a mission family, I have had long exposure to the challenges and gifts of the church in Asia. To work as a partner with the Indonesian Church and representative of the PC(USA) is a joy and a privilege. Although it was not easy to leave an academic career in Berkeley to share the difficulties facing a Christian university in a poor and predominantly Muslim society, basically I love it. I am amazed by the richness and diversity of the church and the surrounding cultures. I love being in a position of always learning, always being surprised at God’s work (in and outside the church), always struggling to catch up and participate in what God is doing in Indonesia. On May 18, 2005, Farsijana received her Ph.D. in anthropology and Indonesian studies from Nijmegen University in the Netherlands. Her dissertation was titled “Politics, Ritual and Identity in Indonesia: A Moluccan History of Religion and Social Conflict.” Farsijana also holds a Master of Arts degree in religion and society from Satya Wacana University in Salatiga, Indonesia, and a bachelor’s degree in theology from the Theological Seminary, Jakarta. Farsijana has worked as a field researcher on social change in the Moluccas for the University of Amsterdam (1999–2000). She was a lecturer for the Institute for Integrated Village Ministry (1995) and assistant director of the Center for Analysis and Training in Rural Development in Tobelo, North Moluccas, Indonesia (1990–1993). During that same period, she worked with GMIH Theological College training pastors in rural development in the North Moluccas. She also taught high school in Jakarta (1988–1989) and was a teaching assistant in ethics at the Theological Seminary, Jakarta. Bernie earned a B.A. in English and Asian studies from the University of Wisconsin in Madison. He spent a year at Huemoz sur Ollon in Switzerland on a L’Abri Fellowship. He then received a diploma from the Discipleship Training Center in Singapore and a B.D. in theology from the University of London in England. He received his Ph.D. in international relations and ethics from the Graduate Theological Union/University of California in Berkeley. Bernie was a visiting fellow at St. Edmund’s College, Cambridge University (1990) and at the International Institute for Asian Studies (IIAS) in Amsterdam (2001–2002), where he did research on religion, power and violence in Indonesia. He is the author of many books and articles, including “Strange Virtues: Ethics in a Multicultural World” (1995) and “Living in a Sacred Cosmos: Indonesia and the Future of Islam” (2018). 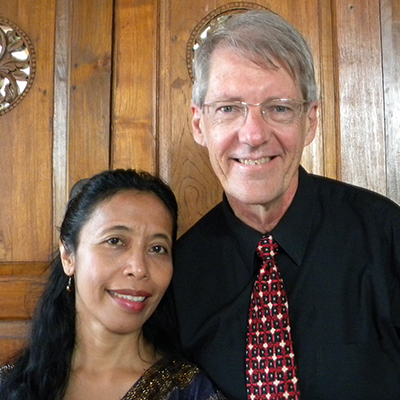 Bernie and Fasijana are members of First Presbyterian Church of Berkeley as well as of the Christian Church of Java (GKJ) in Yogyakarta, Java. They have three adult children, Jennifer Marion, Rina and Peter.